Primary Natural Resources copper, silver, gold, petroleum, timber, fish, iron. PERU IS A country of contrasts. The fourth-largest country in Latin America, Peru has an amazing geography, a rich and long history, a diverse population, and enormous natural resources. Its geography and environment have shaped Peru’s history. Its few rivers, poor and dispersed soils, and extreme altitudes have presented enormous challenges and difficulties to its inhabitants. Peru has three distinctive geographical areas: the Pacific coast, the Andean region, and the Amazon basin. 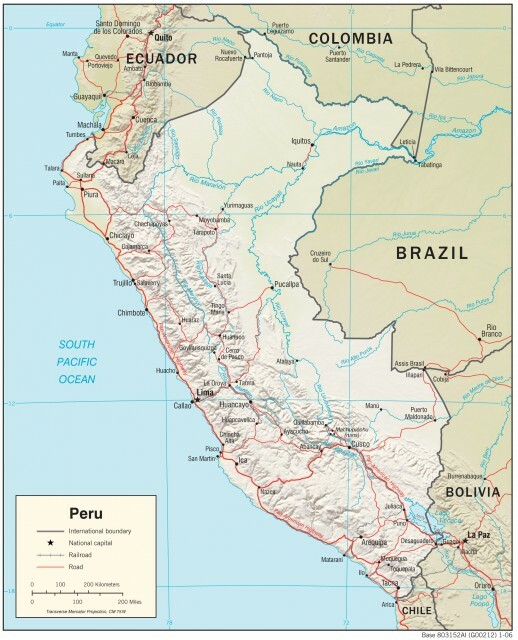 The Pacific coast has been the focus of Peru’s modern political and economic life. The Pacific coast was also the home of the first civilizations in the area, such as the Moche, Nazca, and Chimu cultures. In January 1535, the Spanish conquerors founded the capital city—the City of the Kings, or Lima—on the coast far away from the Inca center of power located in the ANDES. Today, Lima has about 8 million people and is the largest city in the country. A permanent migration from the countryside has created acute social and urban problems in Lima, as most internal migrants have been poor and have settled in shantytowns located in the periphery of the city called Pueblos Jóvenes (young towns). The first export-oriented economic activity developed along the Pacific coast was the guano industry. Extracted from small islands located along the Peruvian central coast, guano, or dried excrement of seabirds, was exported as a fertilizer to countries such as England, FRANCE, AUSTRALIA, and the southern UNITED STATES as a fertilizer. Between 1845 and 1880, Peru exported 11 million tons of guano. The guano boom was followed by an agricultural boom. In the north coast region, sugar production grew steadily between the 1880s and the 1930s, and although production stagnated in the following decades, it has remained a relatively important economic activity for the country. Cotton also became an important commodity in the late 19th century, and especially after World War I. In the second half of the 20th century, the fishing industry became one of the fastest-growing economic activities in the country. By the late 1960s, Peru was exporting 12 million tons of anchovetas, and the port of Chimbote became a growing economic and urban center. The Andean region includes a wide range of climates and microenvironments and has been an important source of mining and agricultural products and livestock. The Puna, the territory located at about 4,000 ft (1,291 m) of altitude, has rich and green grasslands and abundant livestock such as llamas, alpacas, and vicuñas. The lower valleys have been historically devoted to agriculture and have been the home of traditional peasant and Indian communities. The products changed according to the altitude. Products such as wheat, barely, quinoa, and rye can be cultivated at a relatively high altitude; at lower levels, peasants have grown maize, alfalfa, and other vegetables. Toward the south, the Puna ends in the ALTIPLANO or high plateau, where conditions for agriculture and human settling are extremely difficult. Despite the environmental limitations, in pre-Columbian times, Andean cultures were able to domesticate the potatoes, growing about 200 types of potatoes on the eve of the Spanish conquest. The Andes also has rich mining resources such as copper and silver. The Andean region was also the center of the Inca Empire. From the city of Cuzco, the Incas dominated the Andes until the Spanish conquest in the 1530s. The jungle region has two distinctive areas: the montaña, or eastern slope of the Andes and the lower and flat jungle. The jungle area started growing as a result of the rubber boom in the late 19th century. Throughout the 20th century, the jungle has been important for its production of coca leaves and, lately, the development of a tropical agriculture that includes products such as coffee, sugar, and fruit for the national market.